Visiting Transoft Solutions from outside your region? Choose another regional site to see content and events specific to your area. The latest version of AviPLAN adds more functionality to the existing bundle of industry-leading aviation software, thereby enhancing productivity for airport planners and safety at the airside. Built by Transoft Solutions Inc., developers of transportation engineering design software, AviPLAN 2.0 takes all the features of AviPLAN 1.1 ­- including a comprehensive 2D and 3D library as well as simulating aircraft and vehicle turn movements – and adds 3D terrain support, an important function for when the aircraft docks at the parking stand. Knowing the slope angles on the apron ensures the aircraft will be balanced while refueling and allows more accurate placement of the landing gear on the terrain while docking. A specific apron elevation can also be specified in place of terrain, and of course the simple slope grade and direction will be maintained for 2D planning. “Now in AviPLAN 2.0 the complete terrain is picked up for the apron conditions that the aircraft is parked on. So it is the most accurate basis we could do, for this type of analysis,” said Michael Frost, Senior Product Manager – Aviation, at Transoft Solutions. The release of AviPLAN 2.0 corresponds with the introduction of the 2018 version of AutoCAD, making AviPLAN 2.0 fully compatible with AutoCAD 2018 and Bentley`s MicroStation platform. Ben van Leest, VP Aviation at Transoft’s Aviation headquarters in Sweden, said the 3D terrain capability puts AviPLAN 2.0 on the leading edge of aviation software design, particularly in Europe. Another key feature of Airside Pro 2.0 is enhanced functionality when it comes to simulating the docking procedure. While AviPLAN has the ability to dock passenger boarding bridges to aircraft, Airside Pro 2.0 gives users the option to choose which aircraft door they want the bridge to connect to, rather than defaulting to the left-hand-side docking door. Users can also set a rule specifying that if one docking door isn’t available, the bridge docks at the available door. User-defined Tracking Points | Plot points on or off of the airframe to test the placement of equipment in pilot blind spots; Define elements on jet blast contours where engine thrust levels (eg. breakaway thrust) are unspecified by the aircraft manufacturer. Create 2D/3D Presentation | Activate 2D objects and elements for sessions visualized in 3D. Important when visualizing engines and placing fueling connections. 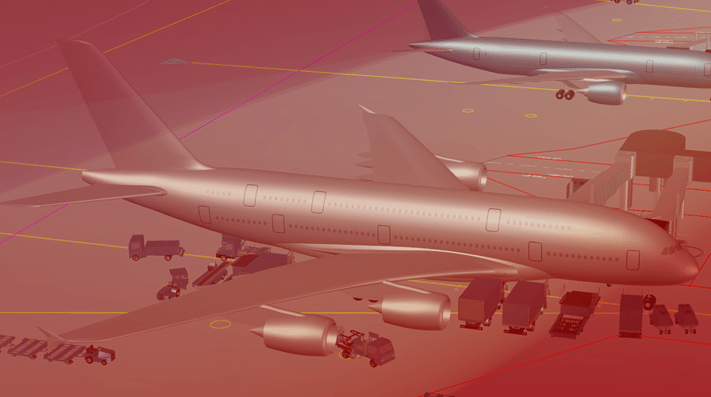 Service Arrangement Improvements | Ground service equipment can be customized where previously the entire arrangement as specified by the aircraft manufacturer was displayed – providing greater flexibility for the user. Bridge Library Data | More detailed passenger boarding bridge library. Import from Database | Import designs from a previous session into the current drawing, to the exact position as originally created. This feature saves time re-positioning the elements, and the imported file can be easily shared with other AviPLAN users. Improved Display | Dialog boxes are now scaled automatically on high resolution monitors. End User Updates | An end user registration is provided during installation, allowing Transoft to email notifications to end users, such as software updates and focused webinars. Transoft Solutions, Inc. develops innovative and easy to use software for transportation professionals. Since 1991, civil engineers and technologists, architects, and city planners across federal agencies, State DOTs, airport authorities, cities, ports, and infrastructure consultants have come to rely on Transoft’s field-researched design solutions. Transoft engineers work closely with the world’s leading agencies including AASHTO, ITE, TRB, TAC, Austroads, and CROW to develop highly specialized applications serving over 30,000 users across 120 countries. Transoft Solutions is committed to providing best-in-class customer support through its offices in Canada, Sweden, The Netherlands, Australia, Germany and India, enabling professionals to design with confidence.